I like a good creature with a drawback, and this has a very interesting one. The self-milling part of it actually wouldn't have been a drawback at all in the first Innistrad block - which, come to think of it, is probably why it's here and not there. Of course, there's nothing preventing you from using them together, and much like the Gitrog Monster from earlier this week, it has an interesting design that turns a drawback into something like a combo. I'm still not sure whether delirium will ever be seen in a deck that isn't specifically designed to have four different card types in the graveyard most of the time; but even in modern times, few creatures are quite this efficient for just this cost, and I certainly wouldn't be embarrassed to cast this card. I know a lot of people aren't exactly nostalgic for Kamigawa block, and the Ogre/Demon strategy was pretty badly executed, but I do sort of miss the old philosophy of Demon design-- massively strong, cheap thugs that come with a drawback you have to pay. Mindwrack Demon would've fit right in as an Oni; just replace Delirium with "control an Ogre". It would have been a lot worse, too, since it's far easier for your opponent to kill your Ogres and watch your own creatures kill you than for him to exile cards from your graveyard. 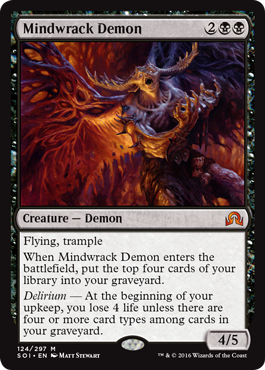 I also like that if you don't already have Delirium when you play him, he might give it to you with his ETB ability... or he might not. And if you already do have Delirium, he still mills you for 4. Classic Demons should be like that: powerful, but still risky.